Muggles, rejoice! The spirit of Harry Potter is still alive and well within the too good for words friendship between Tom Felton and Rupert Grint. Who, like any true friends do, love to mess with each other... but they'll go to great lengths to do it. Which is just fine with me, because it keeps up the wizarding world fantasy I have going on in my head. (Yeah okay, so I may or may not have tried to find Diagon Alley while vacationing in London). According to The Mirror, a friend of the actors said this, "Tom was in a disguise to pull a prank on Rupert. The pair have a long history of playing pranks on each other on the set and off. 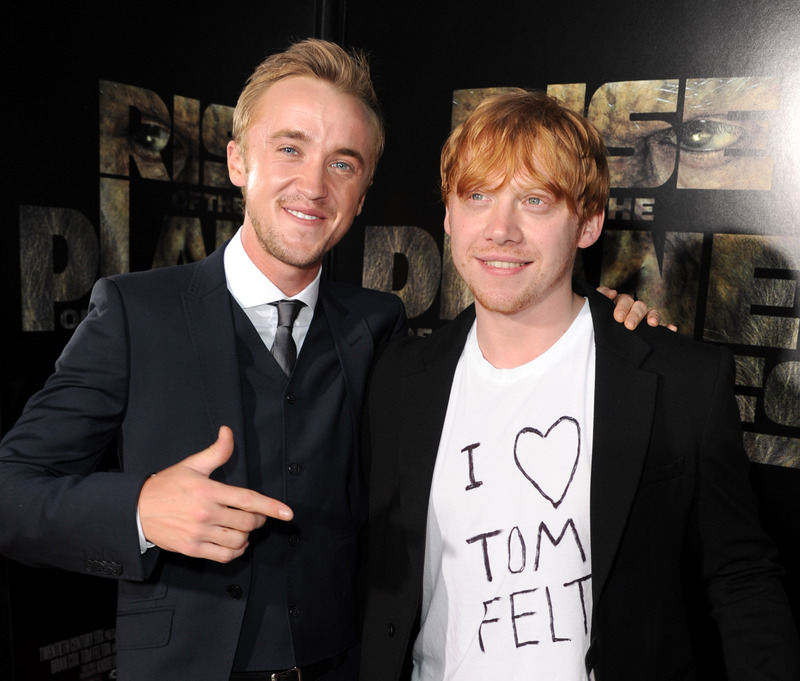 Eventually Tom revealed himself to Rupert. It was hilarious.” Hilarious indeed, lucky friend of both Felton and Grint. The Mirror elaborates on the prank, through a fan's Instagram, explaining that Draco Malfoy's alter ego waited outside of the stage door for Grint at his Brodway show, It's Only a Play, looking a whole lot like a cross between Wayne from Wayne's World and Jay of the iconic Jay and Silent Bob duo, pretending to be a fan in want of a picture. The Instagram caption read, "And then Tom Felton #aliasbob showed up to the stage door in a horrible wig to take a #selfie with Rupert #nyc #broadway #tomfelton #itsonlyaplay #onlyinnyc #chooseanewalias #bobishorrible." All I know is that's a serious prank commitment that I stand behind, especially if he waited as long as I did to see Idina Menzel at the stage door.